Home / Blog / Home & Living / Clearing Your Clutter / The process of Clutter is about letting go! by Carolynupdated on April 2, 2019 February 28, 2011 Leave a Comment on The process of Clutter is about letting go! The process of clearing clutter is about letting go. Not just letting go of your belongings – that is only the end result. The most important thing is learning to let go of the fear that keeps you holding on to them after it is time to move them on their way. People hold on to their stuff because they are afraid to let go – afraid of the emotions they may have to experience in the process of sorting through the stuff, afraid they might make a mistake and regret getting rid of something. 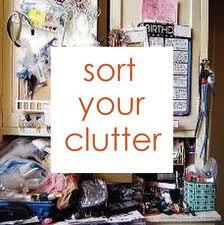 Clutter clearing can bring up a lot of “stuff” to be faced and dealt with, and intuitively every one knows it! Life is constant change. So when something new comes into your life enjoy it, use it well, and when it’s time, let it go. It’s that simple. Hanging on to stuff… keeps you more in the past and subconsiously burdens you! You will feel so much more happy and lighter afterwards… and then there is place again for the new… and you catapult your life in a forward movement… instead of staying put. I believe anyway that life is about development and personal growth… otherwise it gets so terribly boring! and people grow old more quickly! Fear stops you from being who you really are and doing what you came here to do! Fear suppresses your vital life force energy: releasing clutter helps reconnect you to your own natural vitality. Letting go of clutter and cleansing your own inside at the same time leaves you free to be you, which is the greatest gift you can ever give yourself. In my next posts I will touch upon how to identify clutter… as I discovered more recently it is also on the internet these days!!! Does your house feel as though you are tucked up in a warm blanket? Is it a place where you feel at home and where you can relax and enjoy yourself. If not and you would like it to, then drop me a line via my contact page on this site. Previous ArticleWant to know how to de-clutter… read this! Want to know how to de-clutter… read this!